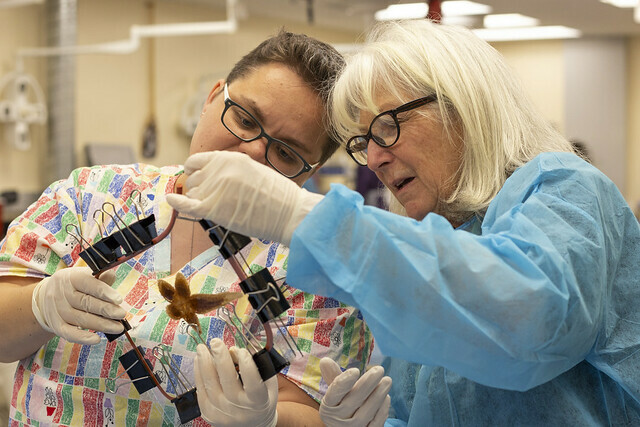 Pictured: Anatomists examine a starfish that has been recently plastinated. Deborah Manog Dimaya photo. Anatomists from willed body programs of West Coast medical schools met at UH Kakaʻako this year to learn techniques from the highly skilled Director of our University of Hawaiʻi Willed Body Program, Dr. Steven Labrash and Anatomy Chair Takashi Matsui, MD, PhD. With humble hearts and appreciation, medical students meet their very first patients– the “silent teachers” who lie before them within the walls of the school’s anatomy lab. For the “patients” the anatomy lab represents their final realm of of medical assistance, where they are cared for even after death. This noble responsibility lies on the shoulders of those who work for a medical school’s willed body program. Pisani was among many who attended the Annual Meeting of the West Coast Consortium of Academic Donation Programs, hosted by the University of Hawaiʻi (UH) John A. Burns School of Medicine (JABSOM) earlier this year. Every year, the forum gathers employees of willed body programs from medical schools spanning California, Nevada, Oregon, Washington and Hawaiʻi. “The highlight of every meeting is the legal review, laws are constantly in flux and the meeting is a great way to look at new legislation and how it impacts our prospective programs,” said Dr. Steven Labrash, JABSOM Willed Body Program Director. Fitting with this year’s theme of “Modern Concepts in Anatomical Donation,” attendees learned plastination, a preservation technique that replaces a specimen’s water and fat with various enduring plastics, through practical application with starfish. “This (plastination) is especially relevant to human anatomy because you can preserve specimens that are intricate, very delicate or larger scale and keep them for much longer and really enhance its educational value,” said Alisa Richardson, Anatomy Labs Program Coordinator at Stanford University. This was the second time the event was held in Hawai’i and the first time that the meeting was extended to a 2-day session.